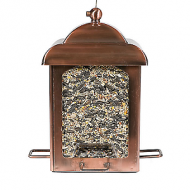 The Perky-Pet® Holly Berry Gilded Chalet Feeder features a circular perch for feeding on all angles. 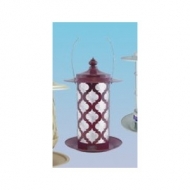 Plastic feeder has a lid with an embossed holly berry pattern. 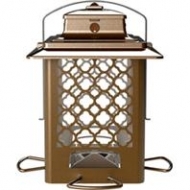 Rustic gold finish is treated with a UV inhibitor to protect it from the sun and prevent fading. 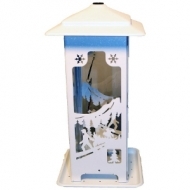 Unique twist off base makes cleaning your feeder so easy! 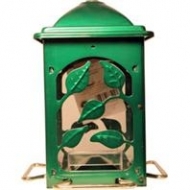 Metal Moraccan Style Marrakesh Songbird Feeder. 2.5 Lb. Seed Capacity. Up to 5 lb. feed capacity. Heavy-duty steel construction. 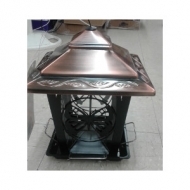 Powder-coated, rust resistant finish. 4 Metal perches. Steel cable for hanging. 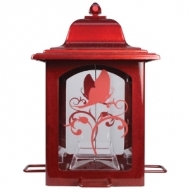 Constructed of durable powder coated steel. Holds up to 4lbs. of seed. Roof lifts for easy filling and cleaning. 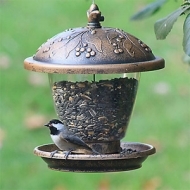 Removable perches provides access for larger birds. Overhanging roof provides seed protection from inclement weather. 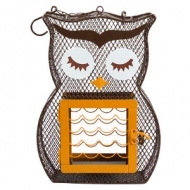 Fully assembled, includes a vinyl coated stainless steel cable hanger. 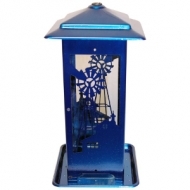 The Giddy-Up Bird Feeder is a decorative tube bird feeder featuring 4 ornate feeding ports with perches. 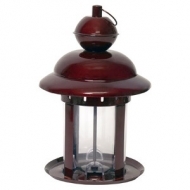 The striking copper-colored finish will catch the sunlight just right in your yard. 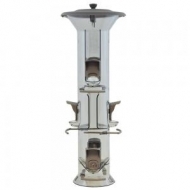 Offer up to 2 pounds of mixed seed with this feeder. 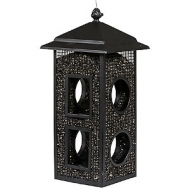 The wide top overhangs the ports to help protect birds from the elements. The top unscrews for refilling and cleaning. 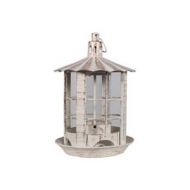 Antique bottle and pewter metal basin and top. Top and basin are removable for easy cleaning. 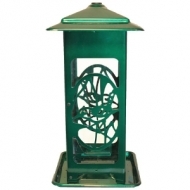 Serves thistle/Nyger or mixed seed - use the included thistle ring insert to serve thistle and feed finches only. Holds 1.5 lbs. 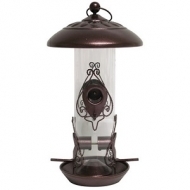 Styled after an old-fashioned coach lantern, the Heath Outdoors Products Brambleberry Bird Feeder adds a pop of warm, rich color to any backyard. 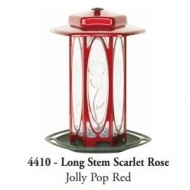 Constructed of durable steel for year-round feeding, it offers 4 feeding ports and holds up to 2 pounds of mixed seed. Drainage holes prevent water buildup, reducing wasted seed. The top unscrews for easy cleaning and refilling. Holds up to 1 pound of mixed seed. Four feeding ports. Steel and plastic construction. Top unscrews for filling and cleaning. 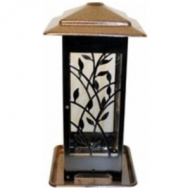 The Harmony is designed to bring balance to your yard. 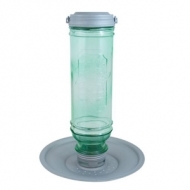 The wide mouth tube is easy to fill, plus the unique hinged sides allow the feeder to readily open for easy cleaning. 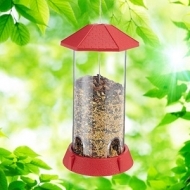 The Harmony feeder is designed to allow you to Choose Your Birds® by selecting which seed to serve and adjusting perch length to fit different sized birds. 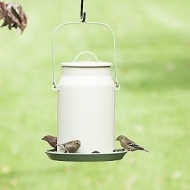 Seed Selection: All six feeding stations can accommodate mixed seed or use the included thistle inserts to serve Thistle/Nyjer. Our Stay Full Ports® ensure that seed is evenly distributed, even when the seed gets low. 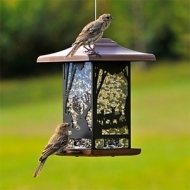 Adjustable Perches: The perches adjust to give the little birds a chance! 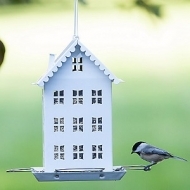 Being able to adjust the length of your perch lets you control who visits your feeder. 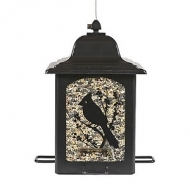 Rule of thumb: A shorter perch discourages large, and often less desirable, birds.